Gregorian chant is, just like reading from Torah or Koran and just like recitation from Iliad and Odyssey, essentially sung poetry. That is to say, poetry which is housed in all those texts and stories which associate individual man with that which surpasses him, which is beyond time and space, which is inexpressible; call it the unnamable, the eternal, the absolute, Atman, Brahman, Allah, God or if you like Nothingness. The most important differences lie in the language and the book. No Hebrew, Greek or Arabic, but Latin, the language of the Roman Empire. No Torah, Greek classics or Koran, but – especially – the Psalms, those beautiful Jewish texts from the first millennium before our western era. Only one subject is in there: the link between man and God. The Gregorian repertory was recorded for the first time under Pepin the Short and Charlemagne, as a means of power to achieve unity in the carolingian empire. 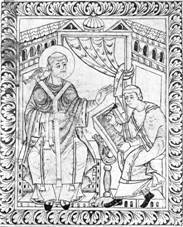 In order to impart more prestige to the repertory it was ascribed to pope Gregory the Great (c 540 – 604), who possibly figured in arranging the songtexts, but presumably had nothing to do with the actual music. 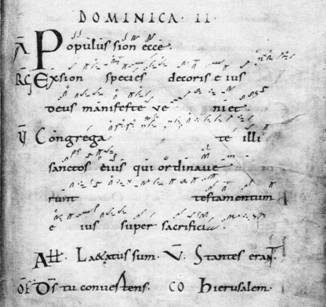 Since the Carolingians the repertory has been copied continually, so that hundreds of manuscripts from the 9th up to and including the 12th century have yet been preserved, comprising some 10.000 songs. By those manuscripts the music had been fixed for the greater part, but musical notation was not unequivocal and therefore continuously in development until, in the 19th century, nothing was left to chance any more. Musical notation has had a hardly to be overestimated influence on the further course of western music history. It also has made possible new musical developments like polyphony and harmony, which grew dominant in the renaissance to such a degree that even Gregorian chant was drastically revised. The vital origin of Gregorian chant precedes many schisms. That between Roman Catholics and Protestants in the 16th century, to begin with. Next that between western and eastern Christians, which seems to be definite since the 11th century. 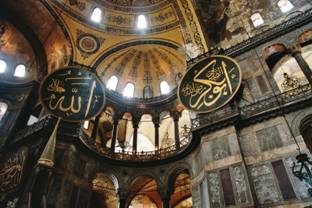 Moreover – not unimportant – that between Christians and Muslims. This last one is less strange considering that Islam was regarded as an Arian form of Christianity at its rise in the 7th century. The most important schism however is perhaps that between musical notation and oral tradition (i.e. : letter and spirit). 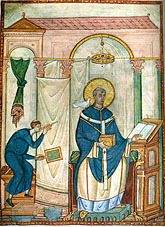 Gregorian chant has come into being between Constantine the Great (273 – 337) and Charlemagne (742 – 814). That means that it had an oral tradition of at least four centuries. It is important to state that the musical traditions of the Orient essentially have remained oral traditions up to nowadays. 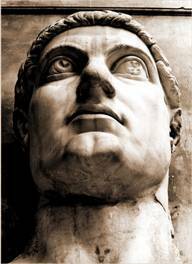 Add to this that Constantine removed the centre of culture to Constantinople as early as 330. 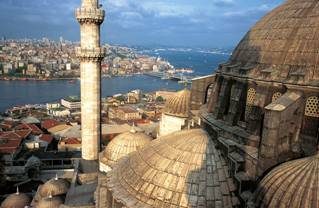 In spite of the graves of Peter and Paul in Rome it remained so until it passed into Turkish hands and finally (only as a result of the Ataturk nationalism in the 20th century) was called Istanbul. Tuesday the 29th of May 1453 is the turning point in that flowing transition of the cultural centre of the West into that of the East. It is not strange therefore that what one can read in the oldest western manuscripts makes very greatly think of that which one can hear even this very day with the best Islamitic singers. In a comparable way one can also find again much of Christianity of the dark middle ages in the lay-out of the mosque and the posture during praying. It would be great if Gregorian chant could contribute to the rapprochement of the various world religions as also to that of religious and non-religious. However, that is only possible if it is considered as that what it is: sung poetry.